David DeeDavid Dee Eckford was born in Greenwood, Mississippi in 1940, David moved with his parents as an infant to East St. Louis. His first musical experience was singing in the church with a spiritual quartet at the age of 12. The family moved to Chicago in 1956 but returned to East St. Louis seven years later where he spent a short time in the army before forming a vocal group �David and the Temptations�. The group practised regularly for quite some time but gigs were difficult and they disbanded during the first year. David, however, was not discouraged and had �picked up the entertaining bug�. He soon began visiting local clubs like Franks Tavern on 21st St, in Polack Town, where he would sit in with the resident bands who initially tried to dissuade him due to his somewhat erratic timing. Eventually, his timing improved and a meeting with drummer Clyde Jones, who was working at the Y Club, led to him being hired as the vocalist for the �House Band�. In 1965 he was offered a regular four-night residency at the Tudor Club working as the singer in a trio with Walter Rice on bass and Wahtachie on guitar for the princely sum of $12 per week. Three years later he formed his own band and when at one of the gigs the bass player �went missing� he picked up the bass guitar and started playing. For similar reasons he learnt to play the piano and the alto sax and in 1972 eventually took up the guitar �because of the lead guitarist�s incompetence�. David cites his major influences on guitar as Little Milton, B.B. King and Albert King (note the order of preference) but comments that Guitar Slim was the real inspiration for him �staying with the guitar�. In 1983 the renowned St. Louis sax player and record label owner Oliver Sain came across David playing in one of the local blues clubs and was so impressed that he signed him on the spot to his Vanessa Record label. He recorded his first release �Get Up and Move/This Would Mean So Much� later that year which was issued as by David Dee and was locally very well received. This was followed shortly after by the huge blues hit �Goin� Fishin� that transcended his local fame and was not only bought nationally but was picked up by blues fans world wide after receiving rave reviews by Bill Dhal in Living Blues Magazine # 70. Over the next three years Vanessa issued a further four singles including the very fine �Christmas In The City/Please Come Home For Christmas� and an L.P �Goin� Fishin� - that was mainly made up of the issued singles - that kept his name in front of blues elite as well as keeping him working hard throughout the Southern Chitlin Circuit. In 1986 David recorded an album for the Edge Label in Los Angeles entitled �Sheer Pleasure� that included the Edge single �On Your Way Fishing/I Wanna Get Into You�. Four years later David was back with Oliver Sain on Sain�s Pulsar Label with a great little single �Working the Dream Overtime/If I Knew Then� (the A side is probably David Dee�s finest work and one can only wonder if there were more recordings of this high standard made for Pulsar Records) In 1991 Ichiban issued a CD by David with the unimaginative title �Goin� Fishin� which despite being produced and arranged by Gary B B Coleman turns out to be for the most part very enjoyable. A further track was issued by Ichiban on a Christmas compilation entitled �Christmas Tears�. Over 50% of the known issued material has been either written or co-authored by David and these songs consist of both straight ahead traditional style blues like �Goin� Fishin� and Working Man Blues� and soul blues ballads in the form of the magnificent �Working The Dream Overtime�, �Don�t Leave Me Holding On� or the funky �Back In Your Arms Again�. After the Ichiban recordings David dropped below the radar, apart from an appearance at the Dutch Estafete in Utrecht in 1996, which led to a week�s residency at the Meridian Hotel�s Lionel Hampton Club in Paris sometime later. I had missed both of these shows and must admit to having almost forgotten how much I had enjoyed receiving and listening to his various singles and albums. And that would have been that except for a chance conversation with Boo Boo Davis, at his recent Shakedown show in Castor that brought up the name of his next door neighbour, David Dee. I almost fell off my chair and asked Boo Boo if he could put me in touch with David. In my excitement I mentioned to audience member and Juke Blues journalist David Williams that I might soon be able to get in touch with the St. Louis blues man David Dee. 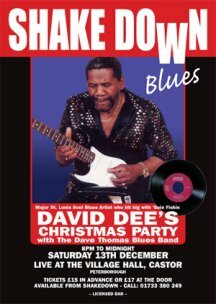 I was surprised when he (David Williams) not only knew of David Dee but had seen him relatively recently and that this show was �one of the best that he had ever seen� and that David Dee was �a really hard working blues man�. A couple of weeks later I �phoned David Dee and the December date was clinched.